A Ferrari worth in excess of £200,000 has suffered serious damage after it was crashed while being taken out for a test drive. The Italian supercar was being driven by a man in a suit near Essex on the morning of the 5 July. The Ferrari F458 was taken from the Lancaster Ferrari dealership in Colchester and driven up the A12 before it spun into a nearby Volkswagen and then hit the central reservation. Unfortunate incidents like this illustrate the value of having demonstration cover as part of a combined motor trade insurance policy. For any car dealership wishing to allow potential customers to test drive vehicles they’re interested in, this cover will protect motorists so long as the test driver has provided a valid driving licence and a member of staff from the trader is in the car with them, as there was in this case. The Ferrari F458 is capable of reaching speeds of 202mph, can accelerate from 0-60 in just three seconds and retails for upwards of £208,000. No one was injured in the crash but the vehicle sustained substantial damage. 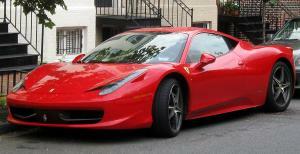 It is not known whether or not the test driver decided to purchase the one of the Ferraris after the accident.